(Nanowerk News) Just like merry people at a party, photons perform random walks through white paint; but their density remained out of control. Recently, scientists at the University of Twente in the Netherlands have managed to control the photon energy density inside opaque materials such as white paint. By combining isolated fluorescent nanospheres inside the white paint as "reporters" with advanced wavefront shaping of incident light, the researchers observe that the energy density of photons in the paint is greatly enhanced, in excellent agreement with a new theory. The results find applications in lighting, solar cells, biomedical optics and random lasers, and are published in July in the Optical Society’s (OSA) high-impact journal Optica ("3D spatially-resolved optical energy density enhanced by wave­front shaping"). When a constant stream of photons in a laser beam shine onto an opaque ma­terial such as white paint, powder, snow, or biological tissue, the randomly arranged particles in the material scatter the photons randomly. Inside the material, the photons perform a random walk, similar to a merry, slightly inebriated, person who tries to reach the other side of the party. Hence, only few photons are transmitted through the opaque material, and most incident light is reflected. This is the reason why snow is bright white: most of the photons incident from the sun are reflected. The photons that perform random walks inside the white paint have a fairly low density that smoothly decreases from a maximum near the front surface towards the back surface. To achieve efficient energy conversion for applications such as solid-state lighting, solar cells, biomedical optics, and random lasers, however, as many as possible photons should go to targeted locations deep inside a scattering medium, in other words: "as many merry people as possible should gather at the party location." Without detailed knowledge of the highly complex three dimensional (3D) structure of the white paint, it seems impossible to control the 3D density of photons inside the material. However, the Twente team has successfully solved this problem by employing recently developed advanced methods wherein the wavefront of the incident light is spatially shaped, see Figure 1. The Twente method relies on the realization that a scattering medium has thousands of transmitting channels. Remarkably, highly transmitting chan­nels exist among all channels. Light is selectively coupled to those highly transmitting channels when an optimized focus is made at the back surface of the paint by spatially shaping the wavefront of incident light. While the input-output relation of light can be easily detected, the internal optical ener­gy density remains unknown. Prof. Willem Vos explains: "Popularly said, we already sus­pected that we could convince many merry people (photons) to join a party inside the white paint. But we did not yet know how the party looked like, because you cannot look inside an opaque material. And we also didn’t know how many people could join." 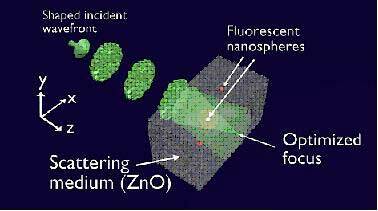 To resolve this problem, the Twente team uses isolated fluorescent nanospheres dispersed in the white paint as reporting particles. 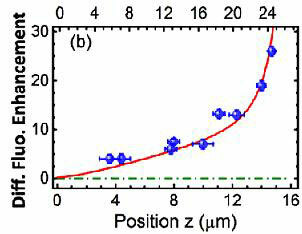 The three-dimensional (x,y,z)-position of each nanopartice is obtained through the fluorescent intensity pattern at the back sur­face. Simultaneously, the energy density enhancement is revealed by scanning the en­hancement of the total fluorescent intensity. With only a single tiny nanosphere at a time, the Twente team had to make painstakingly long observations to collect sufficient fluorescence. Finally, a strong position-dependent energy density enhancement was observed, that is found to agree very well with a newly developed theory. The team managed not only to observe energy enhancement versus depth - as shown in Figure 2 - but also versus sideways position. Vos enthuses: "These results are great news for many applications related to optical energy conversion in white-paint-like opaque materials. We now have a tool to literally “stir” light through white paint to end up at desired locations. For example, we can now control the “whiteness” of a white LED, by optimizing for warm or cold white light. And this is received with great interest by our colleagues in the lighting industry."